Original musings, crafts, etc. by Psaryce because grown-ups like to play too! Yesterday I obtained some bedding via Freecycle. The man originally said 6 dustbin bags. It turned out to be 19 black bags!!! WooHoo! These are just some of the items! I have already filled a 50l tub and a 25 l tub with duvet covers! So I spent all day sorting through and organizing everything into piles. 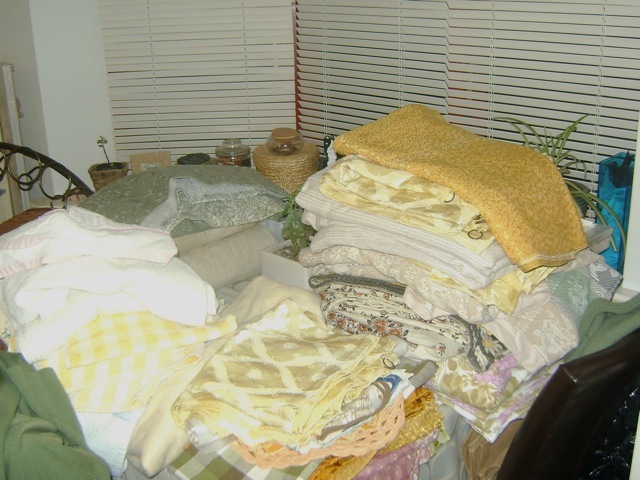 Curtains, sheets, duvet covers, pillowcases, blankets, doilies, towels and pillows. It was great fun for me since with each hand grabbing into a black bag pulled out a mystery object. I haven’t, as yet, pulled out the favourites. Well okay with the exception of a pair of lime green silky curtains that have white vine-type flowers on them. 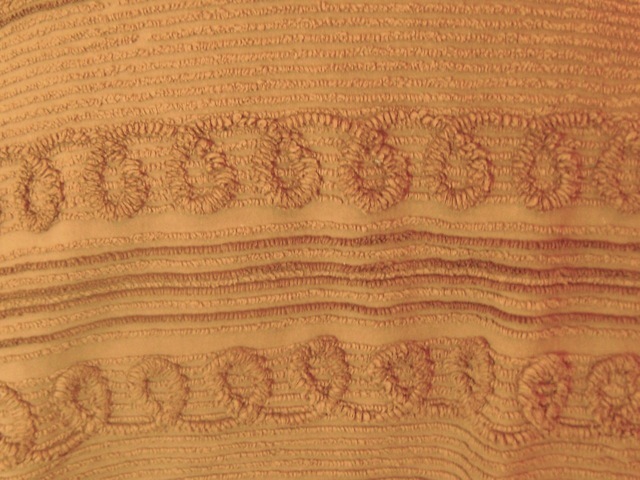 The colour is gorgeous and I love the texture. One thing I love about this lot of goodies is a lot of the items are very retro. 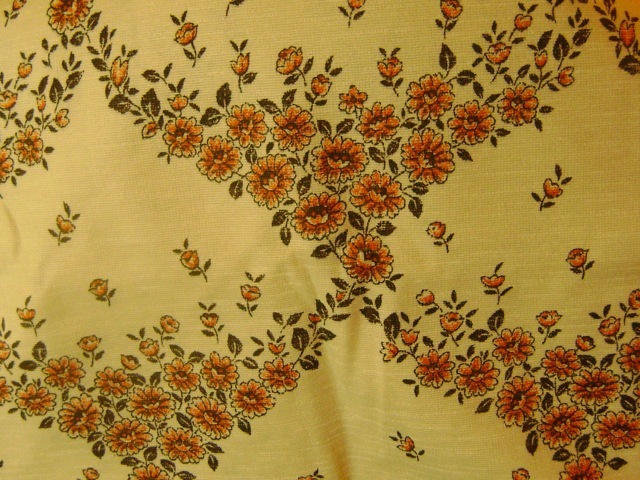 There is even a few of those old 70s style bedcovers … the ones that are like a blanket but have the fluffy lines that make a design (okay will add a photo because this description does not work!). The colour combinations, patterns and textures of the oldie fabrics are so different from what is available today. Granted some of it I will be quite careful when planning what to use it for because it has that look and feel of being highly flammable. LOL I do often wonder how many people survived the terrifyingly combustible polyesters of the past. Given what we now know of those materials, in theory thousands, if not millions, should have perished in flames. Mind you, I am glad that didn’t happen … it is just in the scaremongering, over-protective society in which we now live, you would think that this sort of polyester is simply as toxic as asbestos. After spending too much time recently on the computer creating tutorials, writing and tweaking various sites, I just had to take a break from it today. Everything on the screen was starting to blur and I didn’t want to push my eyes too far or I’d start getting headaches.So after the usual daily household routine, I sewed like mad. And do you know what? It felt great! Each stage of a sewing project is interesting to me. If forced to choose, I’d have to admit that cutting out is my favourite. But there was none of that today. I already had a few things cut and waiting to be stitched up. For me, it never feels right to ignore projects that are ready to construct and start cutting something new. At least I have a very small UFO (UnFinished Objects) pile. Luckily as soon as I started the machine I was whizzing away with the fairies. The stitches machines make never cease to amaze me. So perfect and unison. I guess I find it fascinating because I am so completely rubbish at hand sewing. Cross stitch I am good with as well as embroidery and tapestry but ask me to stitch a straight seam line and I simply cannot do it. So I admire the machine as it sews along. I suspect I may have some deep-rooted desire to try to mess it up. I go slow and then super fast. Normally as fast as possible. And do you know that darned machine stills does every single little stitch perfectly. Thank goodness too because I despise unpicking. To me machines are little miracle inventions. I know the concept is very simple, I understand how all the bits rotate and turn in order for the threads to catch one another. Yet in spite of knowing all the ins and outs, I still find myself astonished by these little contraptions of creation. 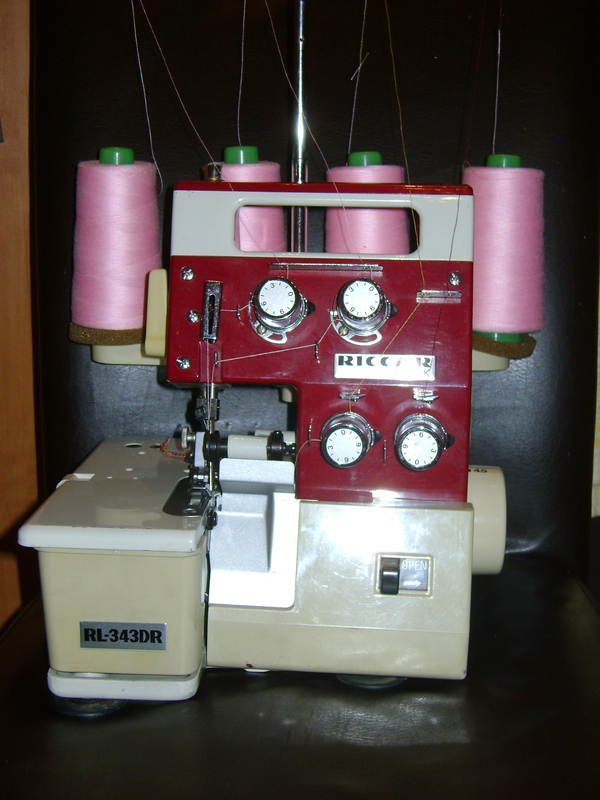 I got another overlocker through Freecycle last night having decided to give it a try instead of continuing the hung for a lower looper for my other one. The kind donor did say it had been given to her but she’d never used it and it had been living in a cupboard for ages. I got it home and discovered it was filthy! Also someone had ‘borrowed’ the plug. Luckily I had a plug spare so repaired that … spent 2-3 hours cleaning it in detail (cloths, QTips, paint brushes, cleaner, you name it). It was sparkling by the time I finished with it! Then I oiled it generously as the crank didn’t want to turn very well and gave it a new lightbulb. The needle in it was broken so the next morning (today) I had to find some that fit (sadly my normal machine needles don’t). My first point of call was a friend (June) who has a sewing business (Recycle & Sew) as I thought she would either have some or would know where to get them. My internet searches revealed the machine is American (and ancient) so when I couldn’t get through to June, I began calling around local shops (I’m far too impatient to order online in these situations!) thinking I wouldn’t find them. But to my delight, in the end I did manage to find a place not far away (Eastleigh Sewing Centre – nice people – friendly & helpful). So I get home with needles and did the struggle to get them into the machine properly – it’s very fiddly and you could do with having multiple, tiny hands for this! The success of fitting them was sadly short lived as the fun of threading it came – Ahhhhhh! There wasn’t an instruction manual but I found one online (Yea!) only it was a PDF of scanned manual and the images weren’t very clear (Boo!) so threading was partially done by guess work. Both of the loopers were tricky and in the end I took one off the machine to clean it to find the hole! So once threaded up, off I went to test it out knowing I’d need to tweak a few bits. Several hours later … I had discovered it wasn’t picking up the left needle thread so I took that out of the equation … eventually discovered the needle was in wrong way round (the tops are round unlike my normal ones which are flat on the back side so the whole episode of fitting a needle was even more fiddly the second time around) … also found out that I hadn’t threaded the needle threads properly … at one point wanted to chuck the thing against a wall … another envisioned a huge bill to have it serviced … and yet another had me wondering how the nice, friendly lady could give such an instrument of torture to anyone … I even asked friends on Facebook to have the white jacket on stand-by! B. To figure out what the heck I am going to do with it!! Seeing as this trip to Israel will be the first time I have gone away for more than a night (and I haven’t done that in years), I decided to make a present to give Hoovy before I leave. Well if truth be told I have bought a few wee things for Daddy to give her while I am away but they are just little things and I wanted something special to say “I love you”. With that in mind I set about turning a free pattern I downloded last year to make “Zeek the Zebra” into a horse. Now all the years I have been sewing, I have avoided making stuffed toys because I find the instructions to be indecipherable and the pieces too small with too many sharpish turns to make. But seeing as this is kind of a big thing (maybe even a milestone?) I decided to give it a go. Using left over flannel sheet bits from when I made myself warmy pyjamas last year, I cut out the pieces and started trying to work out how the puzzle was meant to go together. Eventually, after sewing a few bits together, I worked out that 4 of the pattern pieces were supposed to be joined together in pairs BEFORE cutting out! Since I had used tiny stitches and it was flannel I stood no chance of unpicking the seams and making it work so had to cut them out the right way and start over. Luckily I still have a fairly big piece of the fabric left and those bits which couldn’t be rescued were cut up and used as some of the stuffing. Before sewing this time, I remembered having some fluffy light pink wool (or yarn for the Yanks!) and dug that out. The instructions said to glue the mane on but I opted to stitch it into the seam instead as it will last longer that way (plus I hate using glue if I don’t have to). I used part of an old pillow that I had washed and used for stuffing last year. 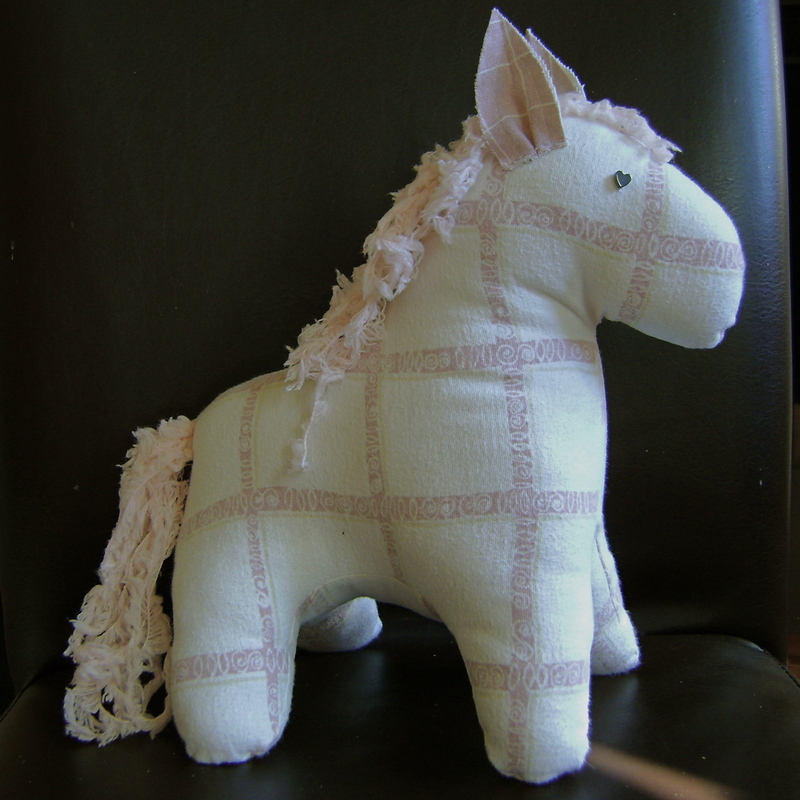 The horse seemed to require loads but somehow still have 1/3 of the pillow left to pook out and use for other projects. 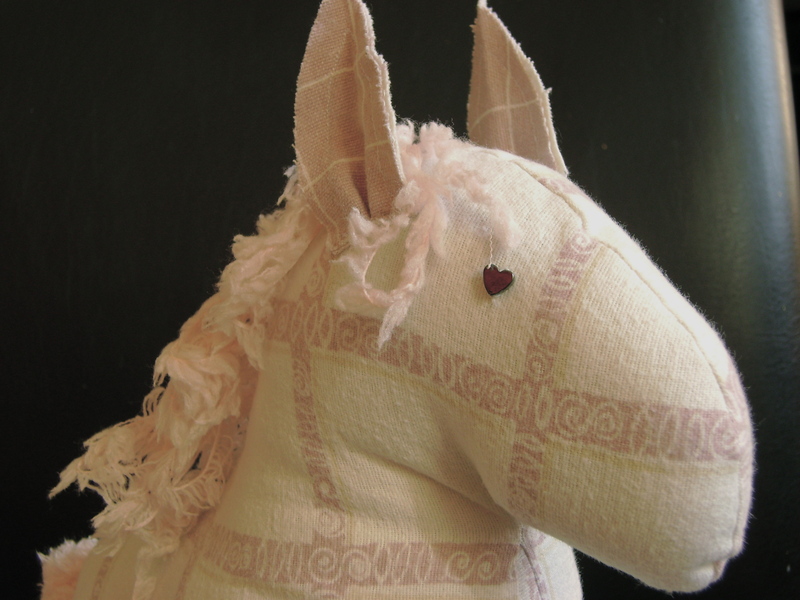 Anyways, after stuffing and sticthing up the final bits, I realised why it took so much … this is one fat horsey! Fat but VERY cuddly and uber soft and will no doubt be loved to death. I have said elsewhere that if I was a bad Mummy, I would pack it in my suitcase, take it with me and keep him for myself. But I am not evil and instead am anxious to give it to her on Sunday! So, without further ado, here he is … The Horse for Hoovy! Since my last exam I have contracted the sewing bug again. It took all of 2 days before I got my machine out, dusted it off and got busy making things. It’s a kippah! 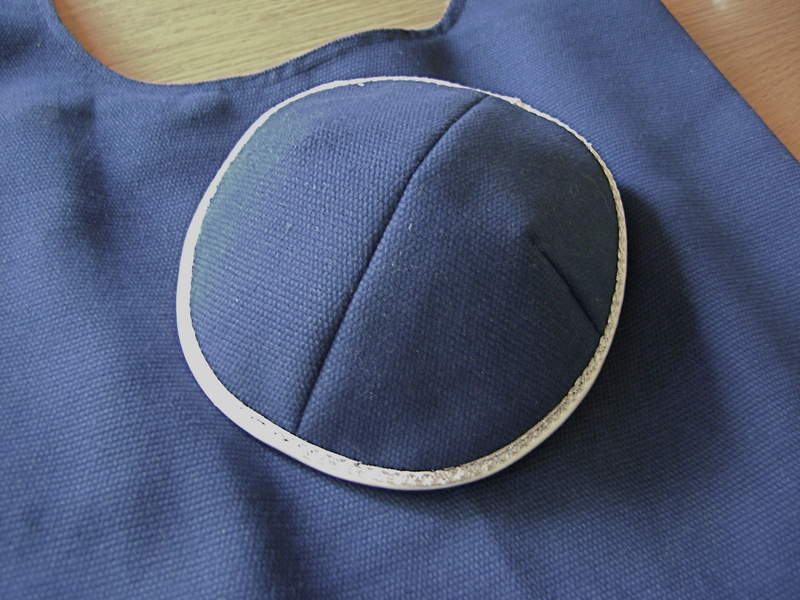 Well also called kippot and yarmulke. It was actually quite fun to make and I am delighted with the trim. Underneath is a bag I made for him as well. It is made like plastic grocery bags so there is plenty of room for stuff but I made the handles longer so it could be carried on the shoulder. 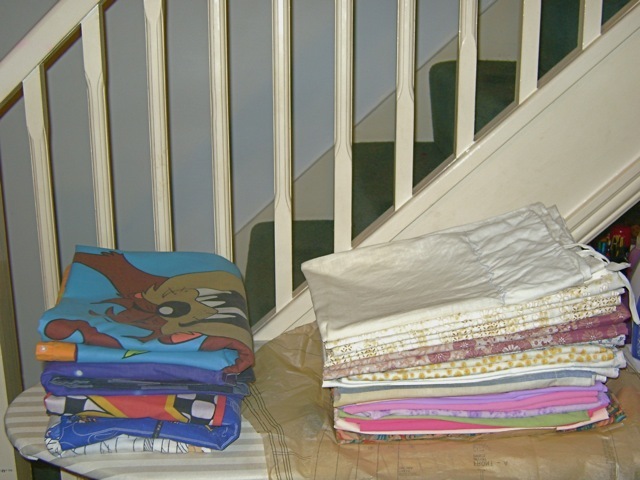 The fabrics for these are: blue canvas type fabric and a white sheet – both received through Freecycle. 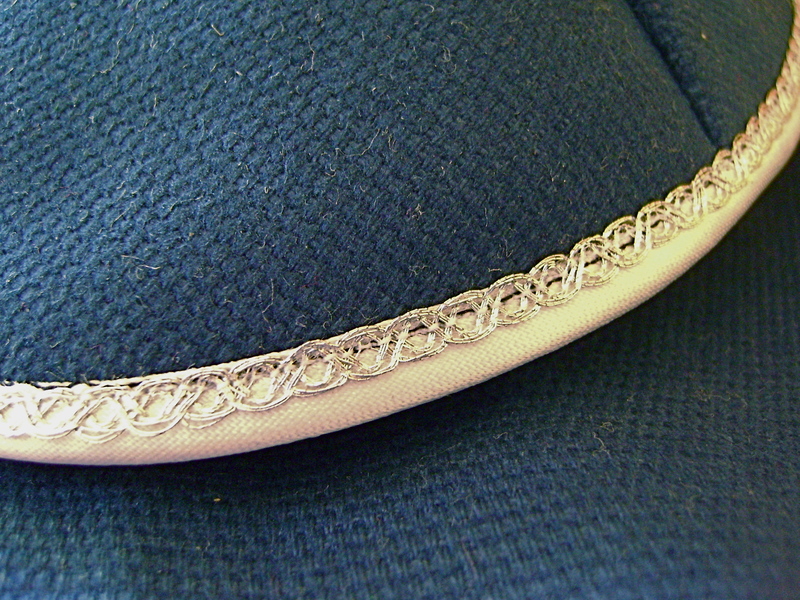 The trim and satin bias tape are both left over from a project I did at least a year ago. So once again a lovely eco-friendly, recycled gift I will give with pleasure! All this does make me wonder though – are we as a society going back t the old ideology that handmake gifts are best? 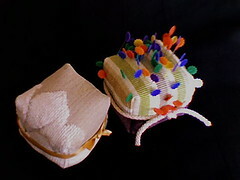 Fed up with keeping my pins in a bowl shaped container with lid, I decided to have a go at making my own pincushions. These cube shaped beauties are made from samples I received of upholstery fabrics and stuffing from an old pillow. Thanks to my lack of a decent camera at the moment, you cannot see the colours very well but the stripey one has a deep purple bottom. The smiley face is thanks to Hoovy. She has decided this one is a hedgehog and enjoys giving him different hair styles … including a few Mohawks. If I do another one, I think I’ll put a weight in the bottom but still it is far better than those horrible tomato ones!!! Well here it is! 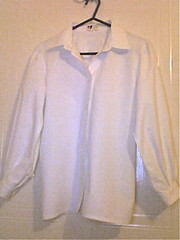 I finally finished the shirt this afternoon- phew. Hoovy was getting concerned it wouldn’t be ready for tomorrow and made a few comments that indicated she’d resigned to wearing it on Thursday instead. She kept a close eye on the progress as I re-attached the sleeves and sewed the buttonholes and buttons on. As I did so, she was comparing my work to that of the pajama shirt she was wearing – making sure I was doing it right! It started out very well until I got to the sleeves. I asked her about how she wanted the cuffs and she choose pleats over gathers. It was simple enough once I got my head around how exactly to do it so they were symmetrical. The real troubles came when I attached the sleeve to the shirt and we discovered it wasn’t just puffy, not even just poufy … it was a mix of mega puffy/poufy! It reminded me of the old Victorian nightshirts it was so ridiculously wide. So the only way to rectify it was to remove the sleeves (grrr – unpicking white on white late at night can make one cross-eyed!). Then I had to re-seam the sleeve (I had opted for false French seams so a bit of extra work there) but luckily managed to taper to the cuff so I didn’t have to re-do that bit! Get Me in Your Inbox!!!! Suddenly SEWING again, and lovin' every minute!